Interest and involvement are high in Student Government at Texas A&M. In the most recent student body general elections, 33% of the student body participated by voting. There were over 13,500 votes cast from a student body of 45,000. At present, there are 30 students who hold titled leadership positions and another 1300 students who work with the SGA committees and programs. All students are volunteers. No student receives remuneration for his or her leadership role in Student Government, including the Student Body President. Student involvement and leadership development have long been traditions at Texas A&M University. However, there is limited documentation of the history of Student Government. Through observations of annual yearbooks and student rulebooks the following timeline was created. Leadership of the Corps of Cadets represented student interests. Class officers were elected and took a more active role as the College grew in size. A more formal “Student Council” was formed that consisted of the fourclass presidents and one additional representative from each class. This council was formed to enforce the honor system and supervise individual conduct outside of the Corps structure. A constitution was created for the “Students’ Association of the Agricultural and Mechanical College of Texas” with the purpose of eliminating all forms of cheating on examinations and quizzes and all forms of stealing in the College; promoting the interest of the student body by publishing a weekly paper and a College annual; and encouraging the support of athletics. The leadership of the organization consisted of the general officers (President, Vice President, Secretary-Treasurer, and Yell Leader) and the Student Council. Every member of the Corps of Cadets was considered a member of the Association, and a majority of cadets constituted a quorum. During times of World War, student representation was inactive. A new “Student Council” was created that allowed for non-Corps (civilian) student population. The Council advised the Dean of Men, student activities, and student life. A “Constitution of the Student Body” was approved, transforming the Student Council into the Student Senate and designating this group to be the governing body of all student activities. The change in structure also brought a change in constitutional officers. The Student Senate was led by a President, Secretary, and a Parliamentarian. The administration of College created another unit of Student Government by granting a constitution to the Student Life Committee, which was created to govern all matters pertaining to student life. This committee reviewed and made recommendations on all Student Senate Business that required the action of higher authorities. The committee was composed of nine faculty and staff members elected by the Student Senate, three student members elected by civilian students, the presidents of the senior and junior classes, the Corps Colonel, and the co-editors of the student newspaper, The Battalion. The president of the College created the Memorial Student Center Council, which joined the Student Senate, the Student Life Committee and the Athletic Council as the college-wide agencies that represented the student body. An article in The Battalion boasted a headline: “A&M has Bicameral Student Government.” The article cited the Student Life Committee as the “upper house” and the Student Senate as the “lower house”. Student Senate was recognized as the highest all-student unit in the A&M Student Government structure. Officers of the Student Senate included a Recording Secretary, Corresponding Secretary, Treasurer, and Chairman of the Standing Committees: Executive Committee, Welcoming Committee, the Exchange Store Committee, Hospital Committee, Mess Committee, Publicity Committee, the Social Committee, and the Texas Inter-Collegiate Student Association Committee. The student body elected the President of the Student Senate, which now consisted of Issues, Student Life, Student Welfare, and Public Relations. An activity point system was put in place to provide leadership opportunities for as many deserving students as possible. No student was allowed to amass more than ten (10) activity points at a given time. This rule was put in place to prevent the overloading of a deserving student to the extent that his education duties suffered. For example, the President of the Student Senate received 10 points, Senior Yell Leaders received 6 points, Student Senators received 4 points, and presidents of other student organizations received 2 points. Therefore, the President of the Student Senate could not take on any other leadership responsibilities because he met the limit of 10 points, while a Student Senator could serve in other areas of campus. The student body elected the President of the Student Senate at-large from classified junior, senior and graduate students. The activities point system further restricted student involvement by requiring students to maintain a 1.0 grade point ratio (on a 3.0 scale) to hold office in any student organization or to run for any elected office. The maximum number of allowed points was changed to reflect academic standing, allowing a junior or senior with above a 2.0 to amass 16 points. 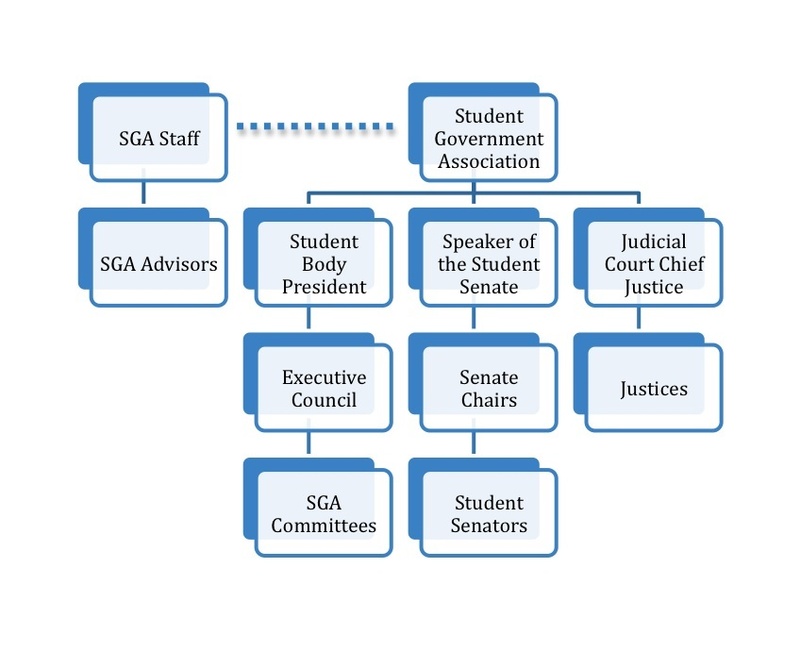 Student Senate was referred to as the representative body of Student Government, and the Constitution for the Student Body refers to the President of the Student Senate as the President of the Student Body. (Office holders were referred to with both titles.) The other officers included a Vice-President, Recording Secretary, Parliamentarian, and Treasurer who were elected at large by the student body; all other officers deemed necessary by the Student Senate were elected by that body. A new constitution (similar to the U.S. Constitution) was ratified by the student body, creating three branches of government; Student Body President (executive), Student Senate (legislative) and Judicial Board (judicial). The Student Body President was given the power to veto legislation and the ability to create and appoint executive officers and committees with approval of two-thirds of the Senate. The Speaker of the Senate presided over the Student Senate. The Civilian Student Council was changed to become the Residence Hall Association and followed the change of representing the interests of students living in on-campus housing. Student Government became a part of the newly formed Department of Student Activities. The Director of Student Activities served as the advisor for Student Government. Vice-Presidents of the Student Body were elected at-large by the students and served as officers (and committee chairs) in the Student Senate. The Student Senate committees included Academic Affairs, External Affairs, Finance, Rules and Regulations and Student Services. The Student Government Association moved into a suite of offices in the new Student Services Building, providing space for officers and each individual committee. The Student Senate began meeting in the new Governance Room. Student leaders requested a more active role for the advisor. Given the demands on the Director of Student Activities, the role of advisor was passed to other advising staff within the department. The Department of Student Activities hired the first full-time advisor for Student Government. This position was placed at a coordinator’s level answering directly to the Director of the department. In August, a graduate assistant position was also added to the staff to assist the new advisor. A reception area which houses the Administrative Assistant’s desk and a reception desk staffed by freshman students who are members of Fish Aides, a recognized student organization and SGA committee. Two large rooms that house the cubicles for the committees and programs office. A computer lab with five new computers available for committee use. An office that houses the graduate assistant and the SGA Technology student worker. The office of Services for Students with Disabilities formally vacated the 126 Koldus Suite and Student Government was finally allowed to expand their offices to include more space for their growing student population membership. This created an office for the Assistant Director (formerly the Program Coordinator), a larger office for the Student Body President, a separate room for the student commissions, and separate offices for the Administrative Assistant and Business Associate III. With approximately 1100 students in and out of the SGA offices throughout the week, the additional space created more opportunities for work and efficiencies to take place. With the addition of the new office space for the Student Body President, Dr. J. Malon Southerland, Vice President for Student Affairs, donated his furniture to the Student Body President upon his retirement. This provided a more formal and efficient work space for the Student Body President to complete his work and meet with other student leaders from across campus. In 2005, the Department of Student Activities began allowing Student Government Committees to formally store their additional equipment/files in the garage of the Schmidt House, a University-owned older 1940’s home that had formerly been used by new staff to the University for short periods of time before they resettled into personal property within the community. SGA held end-of-semester work days to re-organize and purge unnecessary files and equipment in order to keep the garage facility more organized. At this time, the Student Body President and Assistant Director began to meet with the Council on Built Environments to request the building of a storage facility on the empty lot space of the property in order to more adequately insure the security of the items (i.e. t-shirts, equipment, etc.) stored therein. By the spring of 2006, it was determined that this project would not be feasible due to an increased estimate from the University Physical Plant staff. At that time, all work ceased on the storage building project and the Schmidt House garage became the more permanent storage facility for SGA. In the fall of 2006, the position of Program Coordinator for the Student Government Association was reclassified to an Assistant Director position within the Department of Student Activities. At the end of the Spring 2007 semester, the Assistant Director, SDS II Advisor and the Graduate Assistant all accepted different positions outside of Student Government. The hiring search and process began for both an Assistant Director and an SDS II Advisor. In August 2007, the SDS II was hired and began work in early September. The hiring search process for the Assistant Director position was declared a failed search and an Interim Assistant Director from the Risk Management area of the Department of Student Activities was assigned to work with SGA Committees and staff. Based on the impending retirement of the Administrative Assistant in SGA, the Assistant to the Director in the Department of Student Activities moved into a Senior Administrative Position in SGA in October 2007. The only remaining staff member and continuity for Student Government was the Business Coordinator I. In December 2007 staff proceeded with the restructuring of the front office area to create a more friendly and welcoming environment to all students, thus moving the Fish Aides reception desk area to the opposite wall, removing the file cabinets to other areas and replacing it with leather furniture. This was well received by students and staff alike. In January 2008 the Student Government staff and student leaders worked to reorganize and restructure the work area so that all unneeded files and furniture were removed, providing more work space for student committees. SSFAB approves an additional SDS-II position for SGA and a reclassification for the Business Coordinator I to become a Business Coordinator II; Both positions will take effect September 1, 2009. Senate approved a referendum for a non-binding student opinion on the proposed MSC Renovation. It was held December 1-3, 2008. The question voted upon was, “Given the recent developments regarding the MSC Renovation Plan, do you agree with the currently proposed MSC Renovation Plan?” The results were: 3227 NO (66.05%) and 1659 YES (33.95%).